Whether you're looking for parasailing lessons or general parasailing in New York, we are your definitive resource for outdoor adventures in the state! Take advantage of the best parasailing New York has to offer over many great lakes and oceans in the area. Great NY Parasailing for over 20 Years! Offering parasailing rides in NY for over 20 years, Parasailing Adventures boasts a 100% safety record! Experience parasailing from the comfort of the company's own parasail boat. Instead of waiting on a raft, you wait for your turn in the air! All parasails are equipped to fly two to three people side-by-side, and each parasail boat can accommodate larger groups. Parasailing Adventures is open 7 days a week, from 8 A.M. to 6 P.M. Photo packages are available. Feel free to inquire about daily specials. If you're lodging in the NY area, free shuttle service is available from participating hotels and restaurants. 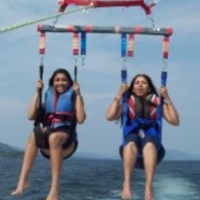 Find out why Parasailing Adventures received rave reviews from 98% of its customers!